We have never been able to just go out and have it start right up. We have had to charge the battery three times since December 25th, and because it never starts right up, my nine year old has only ridden it 6 or 7 times since Christmas morning. It's the perfect size and speed for my 9 and 6 year olds, but it is finicky. 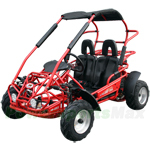 Awesome Go Kart For kids.